Finally…the Wild Heart Mustangs™ embroidered shirts, for adults and youth, are now available in the SHOP! Proudly Made in the USA! Let’s not forget that Wild Heart Mustangs™ also has advertising opportunities available for your event, business, fundraiser, announcements, etc. Affordable options with more “bang for your buck” because we archive all past issues to give you more reader impressions than print advertising. The past month has been a whirlwind. Hay season (yup, we put up our own hay here at the Buck ‘n’ Mule Farm), Reining and Cow Work training for Neeheewanna, riding lessons for me and Kamryn (aka Pocketknife) my 9 year old granddaughter. Our horses have become a family affair this summer and we are loving it! 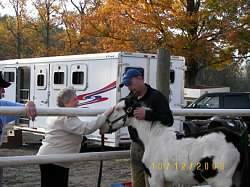 We also went to our first event for the e-zine, the Bureau of Land Management Wild Horse and Burro Adoption in Ithaca, NY – to promote www.WildHeartMustangs.com e-zine and we met a lot of wonderful people. Oh…did I mention we adopted a Mustang while we were there? Why can’t we be like “normal” people and just come home with a t-shirt for a keepsake? Nah… how enriching would that be for our lives? Unless, of course, it was a Wild Heart Mustangs™ t-shirt! This month we have an article from the Black Hills Wild Horse Sanctuary, a place dear to my heart, since we got our first two Mustangs, Neeheewanna and Wakan Lakota, from there in 2008. The work they do for the wild horses and endangered breeds, is phenomenal. The sanctuary not only provides several different tours for you to see the horses running on the range, it also includes Native American ceremonial grounds, petroglyphs, and lodging to stay overnight so you can wake to wild horses by your cabin. I love the Black Hills Wild Horse Sanctuary for not only the work they do for the wild horses, but it’s beauty, serenity, and spiritual peacefulness. Other highlights in the July Issue: Madison Shambaugh shares her perspective on The Power of Synchronization. Samantha Szesciorka shares 6 Things That Happen on a Long Ride, as she has her final preparations for her farthest long ride yet (2016 Nevada Discovery Ride) that she will embark on this August with her adopted Mustang, Sage. Samantha will ride over 1,100 miles in approximately 72 days with one mission: to encourage wild horse adoption. 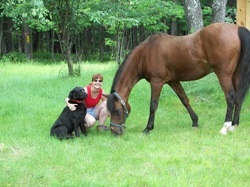 Amy Ortez, DVM shares ways to keep your equine hydrated and healthy during these long hot summer days. L’il Buckaroos celebrates Independence Day and responsible pet ownership. We have a reader contribution by two sisters who adopted three Mustangs this past month and have made a summer family project with them. Thanks for sharing Gretchen and Jennifer! 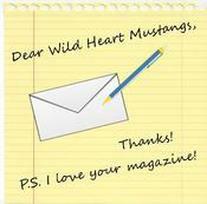 Thank you for sharing www.WildHeartMustangs.com on your Facebook pages! 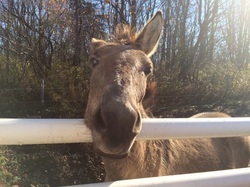 Thank you for helping us continue to grow and to spread the word about wild horses, burros, donkeys, and mules. How many times have you heard, “We already have more horses than we can ride” ? I don’t think I am alone in being on the receiving end of this statement. While it is true that many of us acquire our equine with the sole purpose of riding them and enjoying that activity together, what happens when our mount can no longer be ridden or has limitations due to an injury or health. For many of us our equine are no less a part of our family than our human counterparts. It made me really start to think about the statement and what we see the “worth” of our equines as being. Like everything else, I compared them to humans (because in my mind…animals and humans aren’t that much different. With the exception being that the animals are easier to understand and get along with). At some point in our own lives, we will not be what we once were mentally or physically. Does that make us any less productive or important? Often when we have a decreased ability in one area, we gain in another. So why wouldn’t our horses be any different? Maybe they excel at a new job. My Thoroughbred is retired. She is a senior horse with medical issues, that I no longer ride. I always say that Jenny has the country club life. A life of leisure. While I no longer ride her, she has become the favorite horse of the grandkids because she is quiet and calm around them. She has done it and seen it all. This means a lot to me since the kids did not grow up around animals and find the horses a bit scary because of their size. But there is something about Jenny, even at 15.2H, that makes them comfortable around her. ← Jenny has had a lot of different jobs in her life. Race horse, brood mare, trail horse, teacher, confidant, friend. Jenny is also teaching Angel, our new Mustang. Angel watches EVERYTHING! She absorbs it ALL. Jenny is in an adjoining stall to Angel. So while I am cleaning Jenny’s stall and she is in there with me, Angel sees how calm she is and how she moves when I tell her to. Angel watches me put a flymask on Jenny, watches me put fly spray on her – all while Jenny stands like a statue and is calm and quiet. Now when I go into Angel’s stall to clean, it is not a big deal. ​I can honestly say that my horses/mules have done more for me on the ground, than the time I have spent in the saddle. Countless moments, over the years, of them healing my soul, lifting me up, and putting life into perspective. So while you may find yourself in the situation where you have “more horses already than you can ride” think about all the wonderful things your equines do for your that have nothing to do with riding at all. Think about how they are therapy animals, teaching animals and animals that just plain make you happy. Putting a smile on someone’s face, is priceless. Let’s take it one step further and challenge the potential equine adopter/buyer to consider an animal they might not normally choose to see a new future in it other than riding at all. We rescued Sweet Potato to be a therapy animal, when he is old enough. He has put smiles on peoples’ faces from the day he arrived at our farm. When he was away at training, people would come to their barn, just to see him. No other reason...they didn’t have horses there, they didn’t know him, but they heard about him and they came to see him and always left feeling good. Now THAT is an important job!